We were sent the Quinoderm Antibacterial Facewash to review. Quinoderm with their two active ingredients; benzoyl peroxide, and potassium hydroxyquinoline sulphate, specialise in creating creams and washes for people that suffer from spots or acne. Liam my oldest son is now 14 years old and at that age where he suffers from unwanted teenage spot and blackheads. We have tried many different face washes and scrubs, but we found Quinoderm is not only the most effective, but also gently and caring on the skin. I noticed after Liam had been using the face wash for a week, his skin was visibly clearer. Quinoderm Antibacterial Facewash has a concentrated formula that works deep into the skin to remove dirt and grease from the pores and helps kill the bacteria which cause spots and pimples. 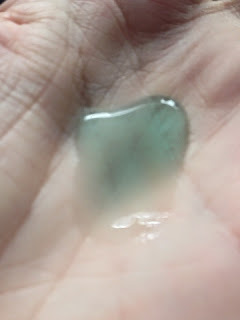 It is a gel like solution, which has a 'fresh' and pleasant minty scent to it. It doesn't foam, but does spread evenly on the skin. Make sure you wash it off completely, and it does leave your skin feeling fresh and clean. Apply morning and night every day, the bottle lasts surprisingly a long time; a little goes a long way with this. You can also purchase Quinoderm at most high street pharmacists, please see here for the list. Disclaimer: We were sent this product for the purpose of this review. All opinions are our own and completely honest.